Social media has become an integral part of business growth today. If a business does not have a presence on social media, it may lose out on customers. This is why you find even the smallest of brands trying to leverage social advertisements and engagement to boost their reach and conversions — especially on Facebook. But many of these businesses find themselves asking: Do Facebook ads work? As of June 2017, Facebook has more than 2 billion monthly active users. It is clearly THE most popular social networking site in the world. Be it for professional or personal use, the social media channel is widely accepted by a wide range of demographics in the consumer market. The above graph should give your business a strong reason to run a Facebook ad and expand your brand’s reach. 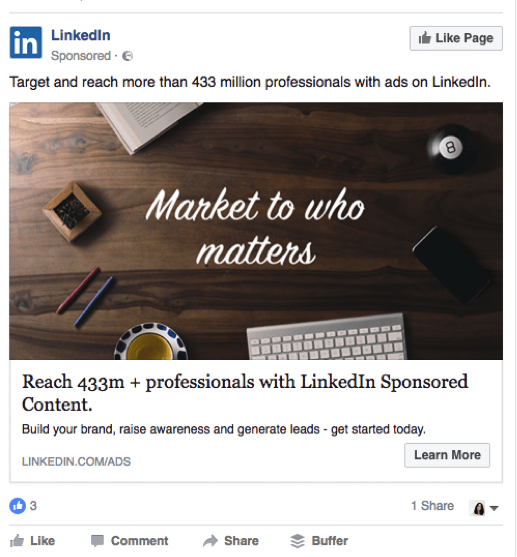 But the Question is … Do Facebook Ads Really Work? Understanding how to leverage Facebook ads effectively is now more important than ever. Since it is a part of almost every successful social media strategy, it is vital to know how your posts can be seen by the right consumers at the right time. While the platform gives businesses the opportunity to reach a mass audience, almost 62% of marketers say the channel is simply ‘pay to play’, and ends up actually missing their target market. Do we agree? Absolutely not. Here’s strong proof that Facebook ads work when executed properly. A campaign that we ran recently generated $103,510 gross sales for the business in just 8 months. We did it by consistently optimizing the ad campaigns as per the changing market trends. The first thing that is most likely to come to your mind upon seeing the above graph is that we had a big advertising budget. And that’s what made the campaign work. Since we had different ad campaigns for different segments of the target market, the results weren’t so surprising. What worked for us that we focused on understanding our ideal customer. The more we knew about them, the easier it got to launch the right campaign. In order to increase the chances of getting a higher return on your investment, always know where your customer comes from, what they engage with the most and what triggered their purchase. Apart from the general demographics, aim at designing campaigns that offer micro and macro conversions based on where the customer is in the sales cycle. When you make the effort to understand their needs, without being pushy for a sale, you automatically focus on creating campaigns that deliver value to the customer. This results in a higher growth slash engagement rate on the campaigns. These campaigns might just be about boosting a post your customers are engaging with the most — or about simply promoting your page in their circles. Simply put, the answer to do Facebook ads work or not, is a resounding YES. Many businesses new to social media marketing doubt the power of Facebook ads. They continually debate on whether they would work for their market or product. Which is why you need to test the waters yourself before executing an ad campaign. It’s always good to take education decisons, so why not? Almost 30% of the marketers fail to define the difference between paid search and paid social campaigns. Now, that’s a big number. The explanation is quite simple: while paid search helps your target market find your business, paid social campaigns help your business find potential customers. Facebook advertising does the latter. It lets you reach out to targeted prospects and customers. It helps you target specific user segments that are more likely to be interested in the products and services offered by your brand. In the process, get more sales. With immense user data about their day-to-day activities, the level of targeting offered by Facebook rivals no other platform. The number one step that you as an advertiser should take is to identify the goal of your ad campaign. Drive relevant traffic to your site? Encourage users to interact with your page? The clearer you are about your goal, the better results you will see. You may want to stick to running one ad at a time or experiment with multiple goals to understand what is fetching you the highest return on investment. The audience segmentation on Facebook lets you define what your ideal customer looks like. Their robust system then displays your ads to users who fall under the demographics you defined. In other words, these users exhibit the type of behavior you have identified. It all depends on how well you understand your customers, and how effectively you’re able to incorporate the data into the ads. Also, the type of format you choose for your campaigns tend to influence the results you get. You may also want to consider using a professional social media marketing company. Let’s take a look at the different types of Facebook ads you can run for your business and what objective they can serve. The very first ad type is the one that will boost your page’s organic reach. The goal of this campaign is to spread awareness about your brand and what you offer. It is to encourage your target audience to follow you on Facebook with a ‘like’ for further updates. Since it is a micro conversion, most users are happy to interact with this ad type. The high engagement gives marketers a chance to target these prospects the right way. They can run lead nurturing campaigns with relevant content and more. These ads help target existing users. They help to generate an activity on your business website or within an app. You could use these ads to highlight new features, new products or simply run an offer that encourages them to engage with your app or website once again. This type of advertising campaigns are best suited to keep your existing customers engaged. These help them stay connected with the brand and also maintain a loyal community. We all know how a few posts do better than the others on social media. When you’re driving people to your page, you will notice that they interact with some content more than what you have been posting so far. That’s your opportunity to target more customers from that segment. Using post engagement ads to boost the reach of your content on Facebook will also get you more likes on the page – a double whammy! One of the primary goals for most businesses and apps is to acquire more users or customers. While engagement ads are targeted at re-engaging existing users, acquisition ads are focused on bringing new users/ customers to your business. Sometimes the best way to get more conversions it to let people know more about your brand. Using Facebook ads you can boost the exposure your brand name gets. But this can only be done when you share remarkable content that establishes you as an industry authority. These campaigns should not be focused on what your brand is all about. Instead, they should highlight why a customer should engage with it. While some businesses focus on global brand awareness, there are some that have location specific goals. These campaigns are set using the geographic location of your customers. And target them with tailored offers for high relevance. It could be to encourage a store visit or to avail an offer on product purchase in a specific area. With localization becoming an integral part of personalized marketing, these ad campaigns are a great way to boost brand recall value as well as conversions. Even though most brand awareness campaigns result in driving traffic to the website, the website conversion ads are a different ball game. They are super-targeted and specific in nature. In short: they take visitors towards a defined call to action on a particular page of your business website. In order to get maximum results from these ads, try experimenting with different call-to-actions. Instead of using ‘learn more’, direct your users to a page where they need to sign up for a newsletter or a free trial of a product. If you’re new to the industry and are just starting reach out to your customers, website click campaigns are your best bet. These campaigns focus on one thing: driving traffic to your website. You could direct this traffic to your blog, product page, sales page, etc. The idea is to let the customer discover what you’re offering instead of pushing them towards a conversion right away. For businesses that have different things to offer, you can make use of carousel ads to send traffic to different links. Similarly, you can also experiment with canvas ads that share the story of your brand with customers and nudges them to visit your website to know more. Interactive content is what performs the best on Facebook. Promoting events and encouraging your target audience to participate is a great way to put forward your value proposition and get a chance to start a conversation without sounding too salesy. But remember to not to club all your segments into one event promotion. The more targeted you remain, the higher attendance you generate. Every business wants a chance to interact with their customer and highlight the value they can give deliver. This is why you see many brands running promo offers or special discounts designed to appeal to their target market. Whether you’re offering something for free, a content upgrade (such as an ebook) or a simple discount coupon for first time purchases, these ad types will work for you. They will help you stand out from the vast volume of content being shared on a user’s feed. The only thing you need to ensure is the look of your ad: it has to be appealing to your ideal customer. The general approach to online lead generation is to drive users to a landing page via a digital advertisement. And have them fill out a form with their contact details. But things change with the new Facebook leads ads. Now, marketers have the opportunity to decrease the drop off from an ad to a landing page. Which is huge. If you are still wondering “Do Facebook Ads Work?” then take a look at the screenshot below. Facebook lead generation ad campaigns allow you to collect a prospect’s information without forcing them to leave the platform. This has resulted in a boost in lead generation results for both B2B and B2C businesses. Once you have chosen the goal of your campaign and the ad type you would be running, it is time to focus on how you can maximize the results. Having run campaigns that have performed well in both the B2B and B2C markets, and experimented with different formats, here are some of the best practices we stand by. Steal these if you want to optimize your ads for maximum results on shoestring budget. Acquiring a new customer is 10X more costly than engaging an existing one. So why waste your advertising budget on getting clicks from cold traffic? When you can use the same to nurture the luke-warm ones already following you on Facebook? Your existing customers and followers are more likely to respond to an ad positively. Since they already know what you offer, the engagement and participation rates are much higher. Which is much better than targeting new users who don’t know much about you or your product. So aim at getting shares and spreading awareness with the help of word of mouth promotions by leveraging your existing audience. No two people from your audience segment will respond to the same ad in the way you want. While one might instantly engage with it, the other might just like the post. The rest might share it in their circles. Which is why split testing your ads is important. Split testing on Facebook enables you to identify which ad is performing better in your audience segment. This way you can focus on boosting the ad campaign that is getting you maximum conversions. Which is much better than trying to run multiple failed campaigns one after the other. Besides the format and the copy of your ads, another way to test your market is to vary the targeting – even if it’s minimal. Be it the positioning of the ad, the bid you set, the demographics/behavior you add or subtract, make sure you create as many variations as you can. Try to think of every variation there could be within your audience segment. Just like the hack above, you’ll be able to identify which ad set gets you maximum conversions and what specific demographic or strategy is making all the difference. Yes, Facebook targeting is one of the best when you’re trying to define your audience. But with billions of users, how do you pin-point those who are actually interested in what your business offers? Installing the Facebook Pixel on your site, you can create a custom audience based on your previous website traffic. This lets you create a similar audience on Facebook. Allowing you to automatically reach out to consumers who are more likely to engage with you. In the process, increasing the number of conversions you get on an ad set. Instead of trying to generate leads on Facebook with a fresh campaign in an all new market, try retargeting your website visitors instead. A website visit is a clear indication that a consumer is interested in what you offer. Why lose the chance to convert him into a lead? Try offering an upgrade or a special discount to those who have visited your website. What’s more these ad campaigns also improve the brand recall value, improving your conversion and engagement rates drastically. Who says a drip campaign can be set only on emails? You can actually set your retargeting ads in a manner that nurtures your website visitors. And turns them into leads with the help of valuable content. Create different ad sets, spaced out by a defined time period. Promote different content pieces to a website visitor based on what they have already interacted with or seen. For example, offer ebooks, whitepapers and other content upgrades that are specific to your niche. This way you would avoid looking like a business trying to spam with the same ad. More variety and higher context leads to higher conversion rates at lower costs. Period. Ever noticed how even the biggest of businesses like Shopify use high-resolution pictures contextual to their campaign? With zero text on it? 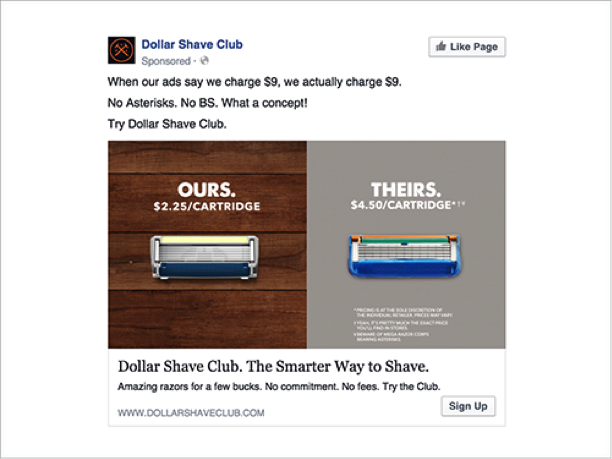 Facebook’s 20% text rule on ad graphics is a well-known rule amongst social media marketers. The lesser the text, the higher is the reach of your ad campaign. So when you’re creating A/B tests, make sure one of your ad sets is using a graphic with no text on it. If you’re not using custom audience on Facebook, spend time to create the right audience with layers of intelligent data. Don’t just include obvious demographics of your target market. Because that’s exactly what your competitors are doing. Look for data similar to what they’re engaging with, their recent milestones, education, job roles, device used, purchase triggers and more. While broadening your ad campaign targeting increases its reach, it is the narrowed down approach that brings you better conversions. One hack that we don’t see a lot of businesses making use is, including social proof in their ad campaigns. If you want customers to believe that you will deliver what you promise, then social proof is necessary. Because there is no better advocate than an existing customer. By simply showing numbers from the results you have helped others achieve can make a big difference. This could be a simple campaign that lets your audience know the value of using your product or service. You can also use customer testimonials that direct users to your case studies. If you want real people to interact with your business, tap into their psychology and trigger emotions that nudge them to take an action. Instead of highlighting your product’s value, focus on using a copy that hits the consumer’s emotion. The closer you are to hitting the right nerve, the more likely they are to seek a solution from you! Now you know the answer to Do Facebook ads work? Yes, and there’s absolutely no doubt about it. If your campaigns haven’t been performing so far, it is time to go back to the whiteboard and relook your advertising strategy. Right from your objectives to who you’re targeting to the approach you’re using — dig deeper into understanding your target customer’s psychology. But as a thumb’s rule, try to keep your advertisements simple. Be consistent in your messaging and make it easy to convert. The longer the conversion process is, the more likely people are to drop off between Facebook and your landing page. Last but not the least, remember to stay as creative as possible. Because monotony creates boredom. Boredom kills conversions. And that’s not what you want. That’s what nobody wants. If you are interested in having someone manage your Facebook advertising campaign for your business, please reach out to us with this contact form or call 404-596-7925. Still have more questions about Facebook? Drop them in the comments below and we’ll answer them! Wow, what a great, in-depth article! Thanks for these tips. Particularly like the list of different campaign formats.